The front ashtray/coin tray may be opened by pushing and releasing the ashtray lid. 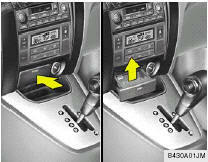 To remove the ashtray to empty or clean it, lift the ashtray upward and pull it out. The ashtray coin tray light will only illuminate when the external lights are on.